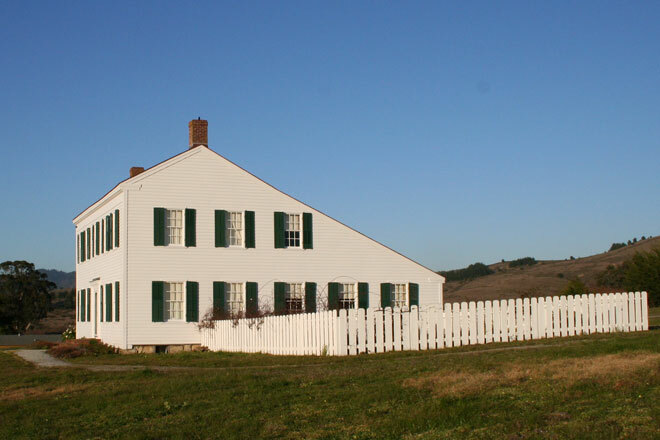 The James Johnston House sits on a hill overlooking the Pacific Ocean, east of Route One, just south of the city of Half Moon Bay. Isolated, its silhouette is a remarkable sight against the rolling hillsides golden brown until the winter rains turns them green. The classic New England saltbox (two stories in front, one in back) was built by '49er pioneer James Johnston between 1853-1855, for his Californiano bride, Petra Maria de Jara. Listed on the National Register of Historic Places, the house has survived 150 years of weather, abandonment, vandalism and high winds and celebrated its sesquicentennial year in 2005. The Johnston House is open to visitors the third Saturday of each month from 11 a.m. to 3 p.m. It is closed October, November and December.